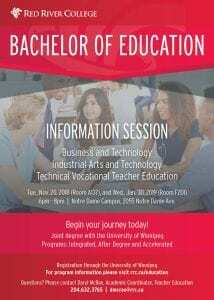 The Teacher Education Department at Red River College is hosting a Bachelor of Education Information Session for prospective students interested in the Busi ness Technology, Industrial Arts and Technical Vocational Teacher Education programs. On Wednesday, January 30, 2019, meet in room F-201, tour Red River College’s Notre Dame Campus, meet current faculty and learn about how the program prepares students for certified career paths in Manitoba’s middle and secondary schools. We will provide program information and details on how to apply.